Stay with this, the best engine Volvo did ever. The black box is a power supply box. I believe my parents didn't know about this. Hi, Kay. Thanks again for your assistance in identifying my Volvo. You're right about the engine; it's a joy to drive, with stump-pulling torque. Sorry about my confusion about your name. I guess that I'm not the first. Did you ever hear that song by Johnny Cash? Visit Volvo owner in France's homepage! Tom, that 1987 manual is just the closest to yours I could find on line, but the ignition system wiring matches yours. Yes it is hard to read, but accurate regarding the wire colors and pin numbers. The interior of the manual is for North American market, but the fold out drawings which I referenced apply to all markets. The only components in your primary ignition system are the distributor, electronic module (the 139) and the coil. That's it. If your car were mine, I would make sure I now have 12V battery at the coil terminal 15 with the key turned on. I would not expect the coil to be damaged by any "accidental short circuits" but that could have happened to the 139 module for sure. Be sure the module is good before replacing any other parts, especially the distributor Hall-effect sensor. The voltage to "run" that sensor comes from the 139 module. The black box you see is distribution for battery voltage. Under the cover are wires and terminals bussed together. The silver box is the step relay, or hi-lo relay, which is responsible for switching between high beam and low beam headlamps. Be sure the power is getting to your coil #15 before moving on. Thanks, Art, I'll follow your instructions, and I'll let you and the others know how I make out after I have charged my battery and installed the new coil. I checked out the wiring from the impulse sensor and the rewired coil to the 139 module; it matches exactly the wiring in the manual that you sent to me. Whether the module and the sensor in the distributor work is still a question. My new coil is installed, and I have verified that I'm getting 12V at the coil terminal 15 with the key turned on. Weather permitting, I am planning on verifying the impulse sensor in the distributor this weekend, using information in this article. - check that the Fuel Injector Computer is pulsing the fuel injectors. I'll post back after I've made my diagnosis. Update: As posted previously, I have installed a new coil, and I have 12V at the 15(+) terminal (I also have 12V at the 1(-) terminal; is that normal?). Thanks to this outstanding website http://cleanflametrap.com/transferPump.htm, I've been able to confirm that the main and auxiliary fuel pumps are operating correctly. I've also tested my fuel pump relay circuits, and they appear to be working normally. I hooked up a spark tester to the coil wire that goes to the distributor, and I am getting a strong, whitish-purple spark. 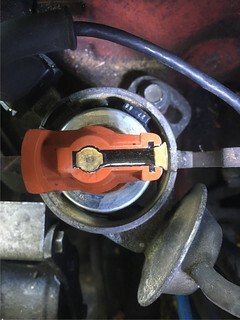 However, testing at a spark plug wire shows a crooked, red weak spark. This leads me back to my earlier idea that the broken radiator pipe had soaked the distributor, destroying my Hall Effect Sensor. I first wanted to 'test the switching signal from the ignition module' https://easyautodiagnostics.com/misc...o-case-study-2, but the 12V test light that I ordered from Amazon.fr will not arrive for another week or two. I did receive another tool to add to my rapidly growing collection, a 6-piece injector Noid light kit, so I hooked it up as illustrated in the website that is linked to in the previous paragraph, and the light comes on but it doesn't blink; it comes on for four or five seconds, then it goes off. The next time that I crank the engine, it doesn't come on at all. Same for the third time. It will then come on again and stay on when I crank the engine a fourth time. From what I read on the website where I found this test, it should flash on and off repeatedly. Am I right in thinking that it's time to shine up my blacksmith skills and replace the Hall Effect Sensor? Or, is it best to wait for my test light, and to test the Ignition Control Module? You can also use a light bulb socket like for the tailights. Make up a couple of wires with alligator clips on the ends. You can use that to check the switching at coil terminal 1. No switching move to the ignition module and see if there is an input to it with a voltmeter. A good voltmeter will catch the pulses from the hall sensor. You can also ohm out the hall sensor and see if it is to spec. I don't remember what it measures but that should be in a Haynes or Bentley manual. Don't know where you put a noid light with kjetronic injection. That is really an efi tool. Somewhere earlier, cleanflametrap (Art) had a good suggestion of running a metal feeler gauge through the distributor sensor gap to trigger the coil. I think all you need to do is pull the disti cap and dust shield, rotate it to a position where there's no metal flag in the gap, and connect the center coil wire to a spare spark plug. Running a feeler gauge through the sensor gap should be similar enough to the metal distributor metal flag to trigger a spark. If not, connect a light or multi-meter to the distributor-to-module signal and see if it changes when you run the feeler gauge through. I hooked up a spark tester to the coil wire that goes to the distributor, and I am getting a strong, whitish-purple spark. However, testing at a spark plug wire shows a crooked, red weak spark. Are you getting the strong spark on the fat center coil wire when cranking? If so, your distributor, module, and coil are all working correctly. If you get the weak spark on a spark plug wire when cranking, then your distributor may not be aligned/rotated correctly. When at TDC, the tip of the distributor rotor should point to a notch in the edge of the distributor. Have you rotated the distributor while investigating the problem? Last edited by bobxyz; 10-30-2018 at 11:11 PM.. Thanks for your response and suggestions. As you suggested, I've ordered a light bulb socket and alligator clips to construct a simple test light. The below photo shows where I connected the noid light. As I mentioned previously, I don't know if it is an indication of a defective Hall sensor or my ignition module has a problem. I'll check the sensor's ohm values and the pulses that are operating the module. I'm not sure what you mean by this: "No switching move to the ignition module..."
Should that be "Now switching..."? Thanks for your post. I have ordered feeler gauges, and I'll run the test that was first suggested by Art. Thanks for having reminded me of it. I did remove the distributor to examine more closely the Hall sensor. Even though I had marked the distributor location on the plate that it sits on, maybe I did get it out of position. I will try to position it at TDC, as you've suggested. The part-swap way to try to avoid drilling rivets or finding another distributor would be to replace the 139 module and maybe the coil. But you could prove the distributor and Hall-effect sensor OK by positioning the dizzy's rotor so the vane's window is exposed at the sensor, then using a feeler gauge attempt to trigger the sensor while monitoring the voltage at the blue/yellow wire, which should follow the feeler gauge placement. The most commonly reported trouble with these is missing insulation on the wires leading to the sensor itself from the connector. At the risk of sounding stupid, can you please explain what you mean by 'the dizzy's rotor"? I wasn't able to find an explanation on the Internet. I checked my distributor alignment, per your instructions, and it appears to be OK. 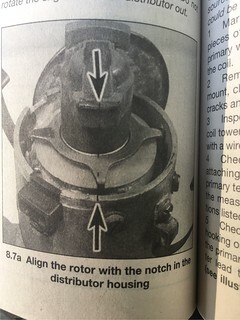 When I manually turned the engine to TDC, the rotor was pointing at the only notch that I could see on the edge of the distributor (see photo). However, in reviewing my Haynes manual, it showed a totally different notch on the distributor. Is that just because of a variation in the different model years? Also, when I turned the engine so that the timing mark came around 360°, the rotor turned 180°, opposite to this notch on my distributor. I suppose that this is correct. Edited: See this post for a picture of rotor and alignment notch when at TDC, and pictures showing TDC marks. Yes, you need 2 engine revolutions to get one distributor revolution. 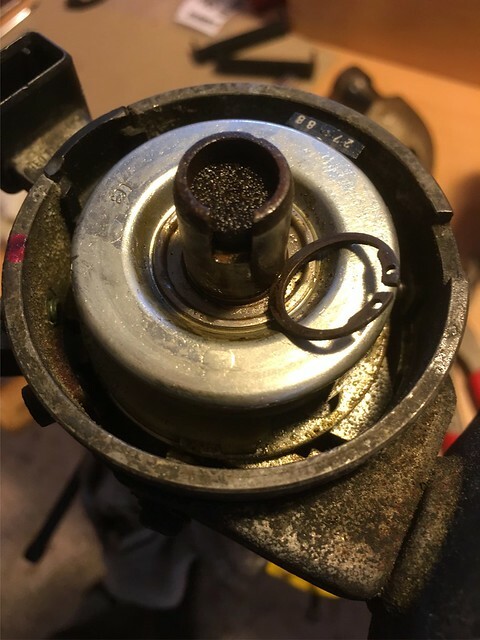 If you're getting a good spark from the center wire of the coil, but not at the plugs, the other thing to check is the inside of the distributor cap. There should be a spring loaded black post in the center. This post contacts the flat gold spot in the center of the rotor and allows the spark to pass to the end of the rotor. If the post is broken, or worn out, you'll get a weak spark at the plugs. Hy Tom, can't work the way you did. Remove the rotor and clean carefully the small round edge with fine sand paper or with steel wool. You will find a mark. This mark is never the "slot/notch" to fix the cap in right position. Your dizzy is now out of 45° if I remember right. Your dizzy should turn clpckwise. If the beginning of one of a small slot at the side of the silver rotor will be in the middle of the hall senor the ignition will get the signal to fire. I can't explain this better in my not natural language, sorry. Like bobxyz wrote: if you have a strong spark at the lead of the coil and a soft at the spark plugs there is something wrong. At first the leads, buy the boug.... ones. Sometimes they get a shortcut directly to the shaft they are mounted on. Bosch dito. Hello. Seems like you are getting close. When I was suggesting checking the switching. I mean with the test light on terminal 1 of the coil. With the engine cranking to start. You would see the test light flash on and off as the system switches the ignition coil circuit open and closed. If there isn't any switching on terminal 1. You can move to the amplifier module and see that the hall sensor input signal is working witha meter. By the way. The BERU ignitioin parts like a distributor cap and rotor are every bit of good quality as Bosch is. They sell it over here reboxed into a Standard ignition parts box cheaper than Bosch. Of course you have to buy the correct one as Standard Parts has a cheap junky part and then the better Beru part. lol. I've learned a lot about the European model B230E from this thread and I sure wish we would have gotten a motor like that here. Here's an update about the Hall Sensor and Ignition Coil Unit (ICU) tests (and thanks to everyone who posted about the TDC marking on the distributor housing and for having explained the term 'Dizzy' to me). I used the feeler gauge test to test the Hall Sensor, and there wasn't any pulse detected when I turned the distributor (by rotating the engine manually) until an open Vane 'window' was centered in front of the Hall Switch, and I passed a feeler gauge in-between the window and the sensor. I tried to detect the signal, as Art had explained, using my multimeter attached to the center blue/yellow (actually a green wire on my 3-wire connector plug in the distributor body), and I also had also seen online a test with a spark plug attached to the coil HT wire. No signal on the multimeter, and no spark either. This other online source also said that I could test the ICU, by inserting (with the key off) a jumper wire to the middle green wire and the black wire in that connector plug. When I turned the engine to the Key ON position and pulled out the jumper wire, there was no spark, but the main fuel pump was activated. This leads me to believe that my Hall Sensor is dead, and that there is probably a problem as well with the ICU. If anyone has any other thoughts, I'd love to hear them in the next day or so, but I plan on ordering those two ignition parts this week from Skandix in Germany, my go-to-place for Volvo parts. Also, thanks for those suggestions about the rotor and rotor cap. I'll also be ordering them, even though they were replaced around two years back. I'll post an update once I've replaced these parts. Now, I need to try to hone my blacksmith skills over the next day to so to replace that Hall Sensor without destroying my distributor. If anyone is interested, the Hall Sensor is going to set me back around €125. The cost of a new distributor is over €350. Well done the diagnose Tom. Please don't forget the "I'm still not a dust cover" , placed under the rotor. A missing one will fry the next hall sensor too. You will find the same parts at other brands on the wrack yard. I did trow away all me hall dizzys for bad luck. I will have a closer look tomorrow at my workshop. I swap every B23x engine to LH2.4 if the carbs or the k-jet is gone. A running B230E is still a very good engine. Please don't forget the "I'm still not a dust cover", placed under the rotor. A missing one will fry the next hall sensor too. Thanks, Kay, for that important reminder. I removed the dust cover to photograph the sensor underneath it. I'll make certain to replace it once I have the new Hall sensor installed. I actually wondered about why it was there. I can understand such a cover when there are points--ensuring that they stay clean and dust-free, but I was somewhat puzzled by its existence with an electronic sensor. Now, it makes sense. I pulled the distributor, and I'm trying to remove the trigger wheel under the rotor and dust cap. I've removed the snap-ring on top of the trigger wheel, and my Haynes Repair Manual says that there's a washer underneath (no sign of it, however) and that I should use two flat screwdrivers to gently pry off the trigger wheel. 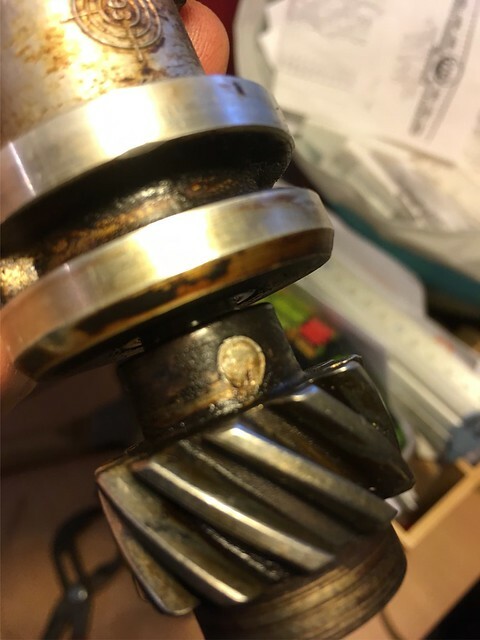 I didn't get anywhere, however, and searching online I came across to a reference to an '86 240, saying that I need to remove, in order to remove the distributor shaft and the trigger wheel, a pin that is 'below' (I think that the person meant to say 'above') the drive gear. The two photos are of the trigger wheel, showing the removed snap-ring, and the pin that I believe must be removed to get at the Hall Effect sensor. I've tried to remove this pin with a punch, and it's seemingly welded in place. Can anyone verify that, first, I need to remove it, and secondly, how to do it without a press. I've already invested in several hundred euros of tools, and my wife is going to put down her foot about my purchasing a press. 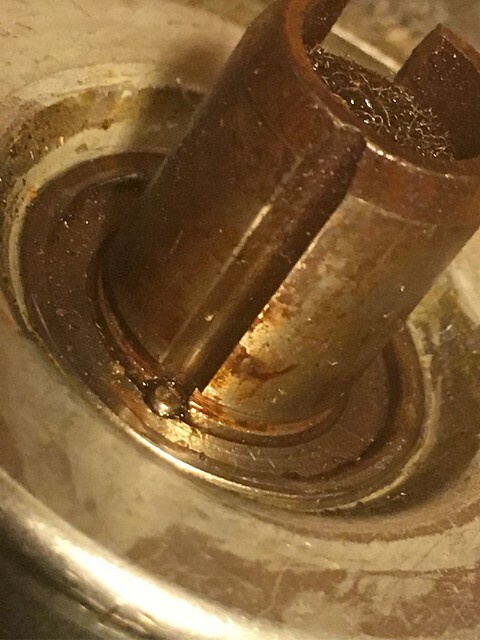 Is it possible perhaps to heat this shaft in order to remove the pin, or do you have any other suggestions? Thanks, as always, for your advice. I wouldn't dissasemble the whole dizzy, only if the centrifugal advance system wont work well. you have to mark or do proper pics of the small centrifugal advance weight springs. they are matched to each weight! you are in france, maybe you will someone with a souriau banc d'allumage to test the dizzy in front of mounting it to the car. I own several ones, still too far away from you. Thanks, Kay. I see that I was working on the wrong end of the distributor. Your link to that "distributor-rebuild" article showed me which small pin that I must remove to gain access to the Hall Effect sensor. I just have to make sense of the explanation about using the pliers and a hammer will allow me to remove it. I'll let you know about success or failure afterward. hy Tom, take care to try this plier trick on the oposite side of the small pin. Won't work otherwise. Thanks again, Kay. It wasn't immediately apparent, from the "distributor-rebuild" text and photos, that the pliers must be gripping the small pin on the underside of the trigger wheel. I'll try your "hint" to get to the Hall Effect sensor. I'll let you know how I made out. I hesitate because I see that it comes without a drive wheel, and I will need to remove the one on mine--a task that seems difficult to impossible without a press. Then, there's an installation manual (see above link to access the SKANDIX page with the manual; unfortunately, I don't see a way to link to it on the forum) that makes me believe that I'll need to rewire the new dizzy, a task that will likely over-stress my, as you've seen, limited electronic knowledge. The best thing is if I could find a company (or someone) in the UK, Holland or Germany that rebuilds these dizzies. Does anyone know of such a place? Kay, in particular? 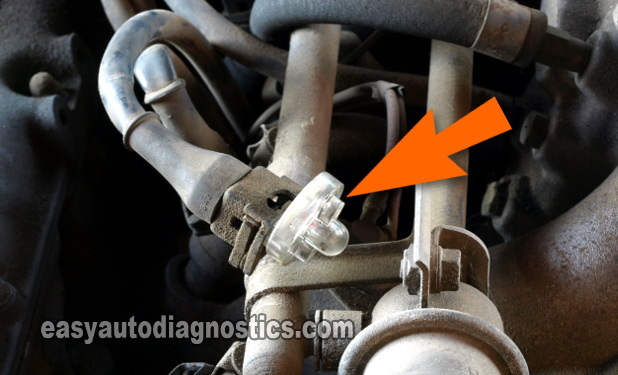 Last edited by Volvo owner in France; 11-27-2018 at 01:42 PM..
Have you confirmed the wiring is good to the sensor before replacing it? I read most the thread. I forget tho. Use a labscope to see the output signal. The trigger star wheel on the magnetic trigger type come off with two screw drivers after you remove a clip. This isn't installed that way? You can use two small screwdrivers to gently lever the trigger wheel up and off the distributor shaft? After removing a retainer clip. That pin is very important but you usually just make sure you don't loose it. It's not keeping the wheel on the shaft in my experience. It's for locating the trigger wheel in the correct orientation.